The artistic and cultural wealth in Spain is very great thanks to the passage of different cultures, such as Arabic and Christian. Discover some of the most impressive Mudejar remains throughout our region. The dictionary of the Royal Spanish Academy defines Mudejar as "an architectural style that flourished in Spain from the 13th to the 16th century, characterized by the preservation of elements of Christian art and the use of Arabic ornamentation." Mudejar is also defined as a rapid architecture in which materials are used by hand, clay and plastering. Particular characteristics of this style are the semicircular arches and the corner friezes; the covers and the apses are the ones that stand out for the most outstanding style. This route covers the most famous temples of the city of Segovia and the west of the province, an area in which the Mudejar architecture had more influence. Our starting point is the monumental Aqueduct, from where we start up the Calle Real to find us, with the church of San Martín located in the Plaza de Medina del Campo, an impressive Romanesque church in which unmistakable examples of Mudejar are appreciated. Strolling through the old town of Segovia we will find impressive examples of Mudejar art such as the Jardín de la Merced, where the church of San Andrés is located, with a brick tower that has a three-storey high blind body, the Parroquial Church of San Lorenzo that presents a splendid brick tower. Another example is the Church of Saints Justo y Pastor, which has beautiful Romanesque paintings inside. 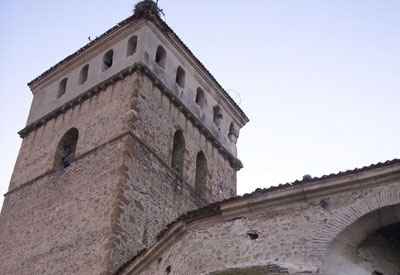 Or the Church of San Sebastián, with a tower that on its base offers two bodies with brick arches, the former church of San Pedro de los Picos. In the outskirts of Segovia you can find a very popular sale called San Pedro Abanto, which was a hermitage with the name of San Juan de Requijada, in which there are clear Mudejar displays on most of its facades. A few 30 kilometers from Segovia appears the town of Santa María la Real de Nieva highlights its collegiate church with beautiful portals and a cloister of Romanesque capitals of exceptional value; there you can discover some corner brick decorations, typically Mudejar. We travel another few kilometers and we enter the town of Nieva, where we will contemplate the church of San Esteban where you can find Mudejar remains in its apse, the atrium and in the tower there are clear examples of this architecture. Then we go to the small town of Melque de Cercos that highlights the Church of Our Lady of Antigua, whose origin is located at the same time of the founding of the place. The temple presents some well preserved Mudejar samples at the door of one of its facades, which faces south. 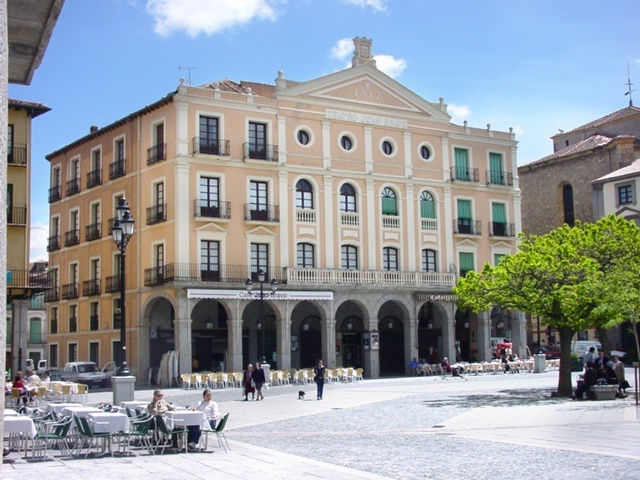 From Melque we continue to Martín Muñoz de las Posadas, a place of undoubted historical importance where his parish church, dedicated to the Assumption of the Virgin, has remnants of Gothic-Mudejar architecture. The church conserves numerous works of art, among which we must highlight a painting by El Greco, "El Calvario", a painting made in the late sixteenth century. The town also has a beautiful and well-preserved palace of Cardinal Diego de Espinosa, a historical figure of notable influence in the court of Felipe II. We head towards Coca passing through the town of Montuenga, in whose parish of San Miguel there is an apse, under the tower, which has several brick arcades, in addition to some other details at various points of the temple. A few kilometers later Tolocirio appears, another small town but in which we can contemplate the church of San Pedro Apóstol, with a head that has more like a castle or fortress than a temple, masonry factory with brick bands. It is believed that this construction, together with a tower that also exists, responds to the idea of ​​serving as lookouts and fortresses, since it lacks this type of defenses for many kilometers around. Two kilometers later, Montejo de Arévalo, in which the parish church of San Andrés has a representative and valuable Mudejar structure, and on the outside, despite the successive restorations, more Mudejar elements can be seen, without missing the corners and cornices of bricks. The hermitage of Nuestra Señora de los Huertos also has a Mudejar coffered ceiling. We return to San Cristóbal de la Vega, where we can appreciate Mudejar elements in the apse of his church of San Cristóbal. The route takes us to Coca, a village in which we will contemplate its main Mudejar attraction, the Fonseca Castle, whose construction began in 1453. Declared a historical and artistic monument in 1931, it is necessary to admire all the exterior, as well as numerous areas of the interior, where Mudejar is also present in various artistic manifestations. The fortress, with a pit of considerable dimensions, has been a center for forestry studies for six decades. Crossing a large garden area, we arrive at the door of the Villa, open on the wall, of medieval times but incorporating Mudejar elements, which have greater importance in the parish church of Santa María la Mayor. Of neo-Mudejar style is the Town Hall of the Villa, and outside the precincts of the same one it is necessary to emphasize the tower of San Nicolás, only vestige of the missing church of the same name, an authentically Mudejar monument. After contemplating the monumental town of Coca, we head for the Mudejar corner par excellence in the province of Segovia: Cuéllar. Shortly after Coca we arrived at Villaverde de Íscar. Locality in which we must visit the parish church of San Sebastian, which has a semicircular apse with the Mudejar style, decorated by two rows of blind arches on a strip of boxes. We are now heading towards Samboal, where we will be surprised by the beauty of its church of San Baudilio, considered one of the greatest exponents of Mudejar architecture in the province; the apse is beautiful and the tower is very remarkable; we must also contemplate another important presence of Mudejar in the interior of the temple. On the way to our next stop on the road, just past the town of Narros de Cuéllar, we can make a slight detour to the right to find the entrance to Campo de Cuéllar, what remains of what was first church and then was converted into hermitage dedicated to San Mamés. And this rest is a great example of Romanesque brick, of a certain height and with a semicircular arch. Cuellar is the most outstanding nucleus of the region in the Mudejar style, so much so that in the well-restored Church of San Martín there has been established a Mudejar Art Interpretation Center. In the Villa they were built in just a century more than a dozen Mudéjar churches, with brick being the main protagonist in doorways, apses and towers, as well as coffered ceilings. In addition to the aforementioned church of San Martín, we must mention those of El Salvador, San Andrés, San Esteban (one of the most unique Mudejar buildings in the province, with an apse considered the most beautiful in its style), San Miguel, Santa Maria de la Cuesta, Santa Marina, Santiago, the Holy Trinity, Santo Tomé ... But it is that the Mudejar is also present in the town in civil constructions, highlighting the doors of San Basilio and San Andrés in the wall, in the Neo-Mudejar palace of Santa Cruz and even in the palace of Pedro I the Cruel that preserves an artistic coffered ceiling of the same style. Impressive, then, the Mudejar panorama offered by Cuéllar, a town also famous for its encierros, documented as the oldest in Spain. 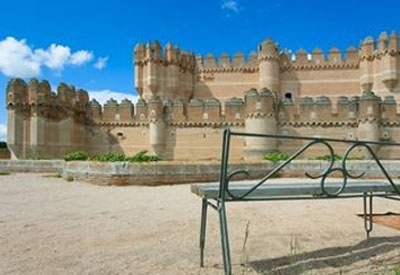 Being in the historical Villa it is impossible to ignore its famous and great Alburquerque castle (in whose southeast tower there are also Mudejar remains). A unique fortress that in its long history has gone through various vicissitudes, until a few years ago a remarkable recovery and restoration of its different dependencies and walls took place, and where a Secondary Education center is housed. In the interior of the fortress stand out the wide courtyard of arms and the gallery in the south facade, both of Renaissance style. But there are many other dependencies, several of which have been used as a stage for the historical representations of different episodes linked to the Villa and the fortress that have been taking place for years, based on entertaining and informative literary scripts that are presented by a great personage of Spanish literature, José de Espronceda, linked to Cuéllar by his occasional stay in the place, a permanence that inspired him the argument of his book "Sancho Saldaña or the Castilian of Cuéllar" (1834). 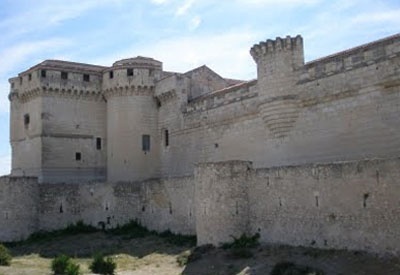 The introduction of the literary character opens the doors to the development of a series of scenes in which the action is transferred to various dependencies of the castle - the Tower of Memory, the cellars, the kitchens ... - in which the voice and the action turn the place into "an inhabited castle". In the first space of access to the castle-palace, on the left, in the Torre del Homenaje, the archives of the Casa de Alburquerque, the Municipal Historical Archive and the Community of Villa y Tierra are installed. We head to the end of our route in Agilafuente, stopping a few minutes in Pinarejos, to contemplate its parochial temple of Our Lady of the Assumption, in which we will discover numerous Romanesque-Mudejar elements, with a squat tower that looks covered with brick. Do not forget the contemplation of very interesting mural paintings both in the atrium and inside the temple. Continue to Fuentepelayo, where you must admire the wonderful Mudejar coffered ceiling that covers the entire nave of the temple of El Salvador. Also the church of Santa María la Mayor has on its exterior some Mudejar samples, it seems that coming from an old atrium of the same style. Finally, already in the village of Aguilafuente, the end of our walk through the Mudejar. The visit to the church of Santa María will allow us to contemplate its brick apses. In this temple a Diocesan Synod was celebrated, in 1472, summoned by the bishop Juan Arias Dávila, event that served so that the acts of the same constituted a book that was first printed in Spain, in charge of the German Juan Parix. 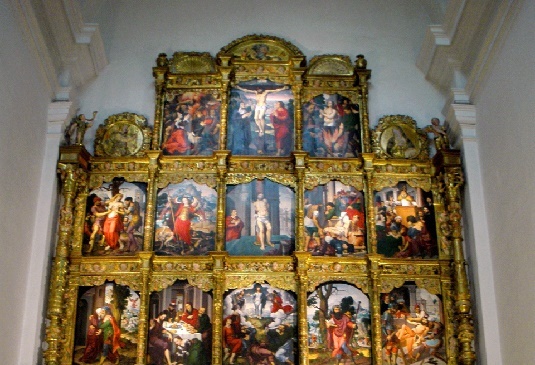 (The only known copy is found in the archive of the Cathedral of Segovia). The temple of San Juan Bautista, saved from ruin a few years ago, also has Mudejar manifestations in sight. For years it has been closed to the cult and now serves as an accommodation for the Archaeological Classroom of the Roman town of Santa Lucía. There are many more hidden treasures, but the best thing is that you discover them for yourself by visiting our region. AdmirorGallery 5.0.0, Author / s Vasiljevski & Kekeljevic.